My exams concluded recently, and the whole process, apart from making me dizzy (! 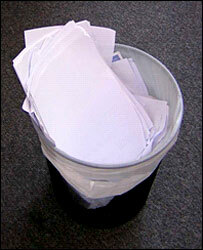 ), led me to think about the issue which stares us in our face, yet gets unnoticed so easily: paper wastage. All of us are aware that the ultimate source of paper is the forest. There is a direct correlation between the amount of paper used and the number of trees felled to obtain it. Although everyone talks a lot about “saving trees” and “deforestation”, most of us don’t think twice about wasting paper. Paper is used everywhere – in schools, colleges, homes and offices – and very often, the wastage is much more than the usage. The reason for this is simply a careless and callous attitude: we use the whole sheet of paper just to note down a shopping list; we use a crisp new sheet to print a small paragraph; we print notices on only one side of a sheet and don’t bother to use the other blank side-the list is endless. To be specific, I’ll take the example of a very well-known MNC (whose mailing portal we all use), where one of my friends interned this summer. She was shocked to see the extent of wastage there- everyday, instructions to interns were given on printed sheets, which were later disposed of in the bin. The company has an active CSR wing and is doing a lot for the society, but in my opinion, by carelessly wasting so much paper, it is clearly abdicating its responsibility towards the environment. Most unfortunate is the fact that we don’t even recognize the amount of waste we generate unnecessarily. I claim it’s unnecessary because it can be easily reduced. All we need, is to be a little more careful and sensitive – using the blank side of bills to note down shopping items; reusing envelopes by pasting a sticker on the address area; using one-side-used sheets for rough printouts; requesting our bills and bank statements to be e-mailed to us; recycling newspapers and magazines and so on. Returning to the example given above, the company could mail the directives to its interns, or post a single notice on the office information board to give out common instructions. Essentially, we need to minimize waste by reusing and recycling (when reuse is not possible). I truly believe that these small steps can go a long way in conserving paper and saving our precious forests. And to conclude on a lighter note, perhaps we could also ban exams, to reduce the wastage of paper! Saving 40,000 trees/year. A Dept. of Environment, Delhi Govt Initiative! PrevRecession and Environment: Why Bother? The amount of paper that we use depends on our lifestyle and profession. It is up to us on how we will maximize its use and how we can be practical about it. There are numerous ways as to how we can reduce paper consumption – we can make use both sides of our printing papers and we can also have them shredded so that they can be used for other purposes.